Bag piper David Bowers gives tribute at founding father Professor John Uther’s memorial. A packed auditorium of staff and family paid tribute to the late Professor John Uther AO at a memorial service hosted by the Westmead Association this afternoon. 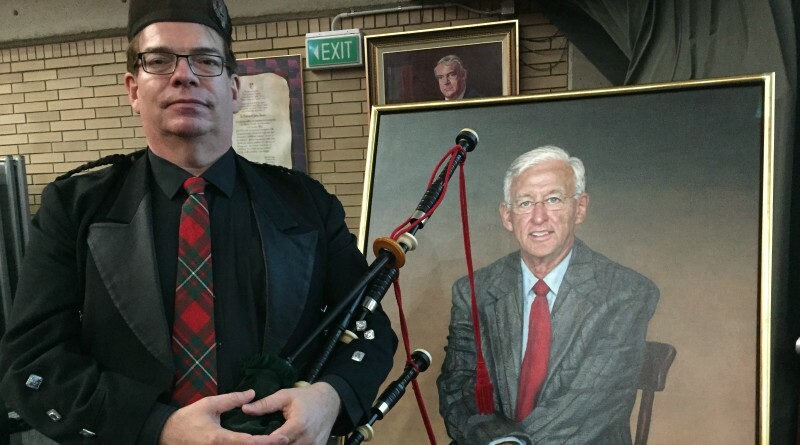 Westmead Association executive officer Georgette Hanna said the service was a fitting tribute to the founding father of Westmead Cardiology, featuring the distinct tunes of bagpipes, reflections and memories shared by family, past and current staff and a photo slideshow highlighting his upbringing. Hundreds of gardenia seedlings were offered as a memorial token. The proceedings commenced with a welcome from Western Sydney Local Health District (WSLHD) chief executive Graeme Loy which led into a compassionate and heart-warming address by the late professor’s daughter Dr Penny Uther. There were memorable and at times humorous orations from Rob Denniss, David Ross, Dr Paul Russell, Professor David Richards, nursing managers Robert Zecchin and Monique Bartlett. Other guests included WSLHD board chair Richard Alcock, Westmead Hospital’s Professor Jeremy Chapman and acting executive director of nursing midwifery and clinical governance Danielle Levis. “Professor Uther was a mentor, teacher and inspiration to so many cardiologists nationally and internationally, and challenged all to aim for excellence for patient care,” Georgette said. Professor Uther is survived by his wife of 50 years Dee, children Penny, Anne, James and William, as well as three grandchildren.